Succulents and cacti are favored in difficult landscapes and garden plans because they can adapt to a wide range of conditions, including poor soil and irregular watering. They have the capacity to store excess amounts of water in their stem, root, or fleshy leaves, or have additional adaptations, like hair on leaves, to reduce water loss. Besides the cactus family with thousands of species, there are over 60 plant families that contain succulent plants of various shapes and growth habits. Depending on the species, you can grow them from several planting materials or purchase young plants or mature specimens from nurseries. 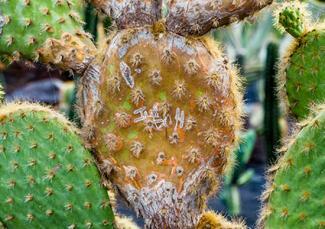 Cacti have seeds embedded in the fleshy pulp of their fruit. Clean and dry them before sowing. Yuccas and agaves carry relatively large seeds inside their dry pods that often give good results when sown. They should be ideally sown in deep pots to accommodate their long tap roots. Most people find it easier to grow a large number from stem cuttings. Make a clean cut to take a section of the stem with a crown of leaves. Allow the cut end to dry out and form a callus (a layer of repair tissue) before planting in a well-draining medium such as sand and perlite. Water once and allow the medium to become nearly dry before watering again. Most stems take root without any rooting hormone. Cacti, sedum, aeonium, and crassula are easily grown from stem cuttings. Many clumping and rosette-forming succulents such as agaves, yuccas, echeveria, sempervium, and similar varieties, form pups (offsets) from their base. They can be separated from the parent plant and planted. 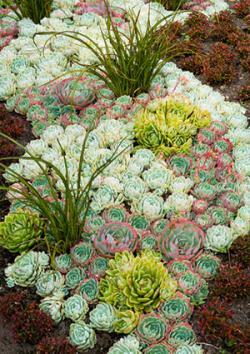 Several species of semperviums, like Echeverias and Jovibarbas, which are known as hen and chicks, feature parent plants surrounded by a multitude of pups, each one capable of becoming a new plant when severed from the parent and planted separately. Quite a few sedum varieties readily make new plants from their leaf bases. Mature leaves that naturally fall off the parent plant can be laid in a bed of damp sand. They will put out tiny plantlets and roots from their base. You can gently pry off a leaf or two and try your luck too. Many species of kalanchoes develop tiny baby plants with attached roots from the dents on their leaf margins. They eventually fall off and take root in the soil below. You can pluck them out and plant them in damp sand. Cacti and succulents are easy care plants, no doubt, but they do have a few cultural requirements. Succulents do best in a sunny position although many of them can adapt to semi shade with greener leaves and suppressed flowering. Too little light will result in weak stems that stretch too much. Six hours of direct sunlight is ideal. Many sedums that normally form compact heads have leaves spaced far apart if they don't get enough sunlight. However, in very hot climate, excessive sun exposure may stress the plant, and cause it to develop reddish pigments referred to as stress coloration. These highlights may even make the plants more attractive than their normal counterparts, but repeated stress may affect the health of the plant. 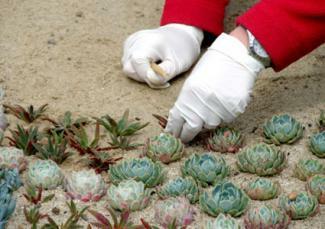 Succulents do not enjoy dead and decaying vegetation around them as much as other plants do. Try to remove all debris from the base of the plant. Non-organic mulching with gravel and pebbles is preferable to tree bark and other organic mulches. 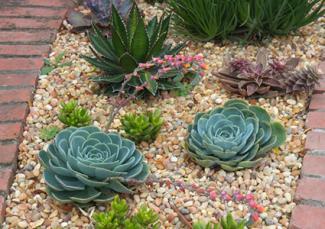 Succulents do not need as much water as most other plants. Since they can store water, it is better to water them deeply, but occasionally. There is no such thing as an ideal interval between waterings, but you will gradually learn what works for each kind you own. Scratch the soil with a stick to check for dampness before watering. The soil should be nearly dry. Unlike thin-leaved plants, many succulents do not wilt easily. However, they show signs of severe water scarcity by dropping leaves or looking listless with dull-colored leaves and stems. Over-watering is considered the greatest enemy of succulents, but more than the amount of water given, it is the lack of drainage that causes problems. Many, including cacti, grow well in areas that receive plenty of rainfall as long as the rain water drains away quickly. They do very well on natural slopes. Before planting one in the desired location, dig a large hole and fill it with sand, gravel, compost, and soil. If you're planning on a drought resistant landscape with mainly succulents, it pays to create artificial slopes to increase drainage. Many larger plant varieties are slow-growing, but a bit of feeding can accelerate their growth. Since these plants can grow in poor soil, it is a bad idea to feed them unnecessarily. Some plants may develop split stems when chemical fertilizers are used. These damaged areas may potentially develop infections. Excessive growth increases maintenance, too. Slow-release natural fertilizers, like bone meal or fish emulsion, may be used occasionally in spring or summer, but never when the plants are dormant. Succulents that flower profusely may love some additional feeding before and after flowering. Cacti and succulents are generally free of pests, but sap sucking insects such as mealy bugs, scale insects, and aphids can be an occasional problem. Plants grown in pots can be cleaned manually, but chemical treatment may be necessary for larger plants in the garden. Take control measures as soon as you spot pests. Severely infested plant parts should be cut off and burned. Keeping the surroundings clean and dry and ensuring good air circulation can go a long way in preventing bacterial and fungal rot, a relatively common occurrence. The plants should not be watered by spraying. Water droplets on the leaves and stems trigger rot. Most do extremely well in pots. Whether your collection came from seeds or some vegetative parts, you will have more success if you pot them up as early as possible. Plants with roots hate to be moved, so they should be planted in their final destinations when the roots are still thin and hair-like. Seedlings develop a long tap root quite early in life, and may become stunted unless they are accommodated in tall pots. 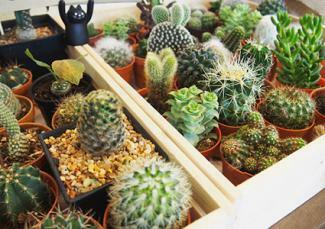 Attractive groupings of small succulents are often available for sale. It's a good way to get a number of varieties on the cheaper side. However, all of them may not have the same cultural needs. Additionally, their growth habits may not be compatible, with some vigorous types taking over the container soon at the expense of the more delicate ones. You'll give them a better chance by potting them up individually. You can make your own grouping later once you get to know the needs of each plant. Succulents don't like compacted and waterlogged soil. Fast-draining coarse medium is favored. The pots should have large drainage holes. Root rot due to excess water in the root zone is the leading reason for losing many valuable plants. If you live in colder areas prone to frosts, it is always wiser to grow most of your collection in individual containers or community plantings in large tubs. Nowadays you can find cold-hardy succulents that can survive outside in USDA zone 4, but the tender ones should be moved indoors at the first hint of frost. Their fleshy leaves and stems may become irrecoverably damaged if exposed to frosts. Allow the plants to rest by cutting down water at the approach of cold season. Their light needs also can be considerably reduced if the plant is dormant. Common problems you may experience often have fairly simple solutions. Leaf drop can be caused by too little or too much watering. Check the soil before watering and ensure good drainage. Lanky plants can be due to too little light. Move to bright light or direct sunlight. White fuzz under the leaves are signs of mealy bugs. Yellow crusting on the stems and young stems means you may have aphids. Touch the leaves with cotton dipped in isopropyl alcohol or spray insecticide. Brown spots or holes on the leaves means water droplets on leaves. Do not spray water on the foliage. Water only the roots. Although succulents are not particularly difficult to grow, it is important to do your research before purchasing. This will ensure that you know the needs of the plants you have and can best meet these needs for vibrant and beautiful plants.